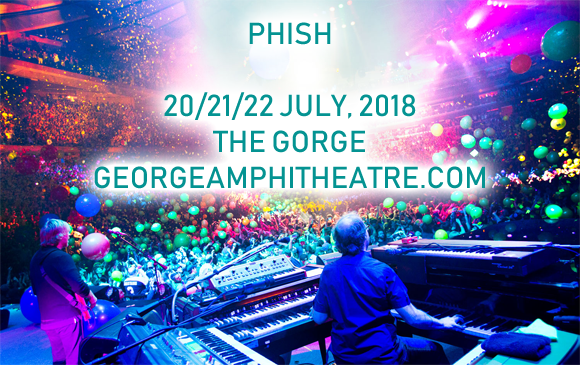 There's something Phishy going on at Gorge Amphitheatre on Sunday 22nd July 2018… Celebrated psychedelic wonders Phish will be bringing their groovy jamband improv to the Gorge, complete with an insane light show, funky collaborative musical explosions and the on-stage antics that make them one of the world's most noted live bands! Live at one of the most noted outdoor venues in the world, it's a match made in heaven! Phish are an American rock band, formed at the University of Vermont in 1983 by founding members Trey Anastasio, Jeff Holdsworth (both guitarists) and drummer Jon Fishman. With the addition of keyboard player Page McConnell, the current band line-up of "Trey, Page, Mike, and Fish" has played together on and off since 1985. Known for their sprawling, improvised jams and eclectic musical influences, Phish have a cult following akin to the Grateful Dead and fans travel the world to see them perform live. Forerunners of the jam band explosion, Phish have sold over 8 million albums and DVDs in the United States, having released 13 studio albums to date.